Location of investment site Investment site # 1 – industrial park “Dolyna” – is located in new part of the town, and has access to national motor road P-21 Dolyna–Khust. 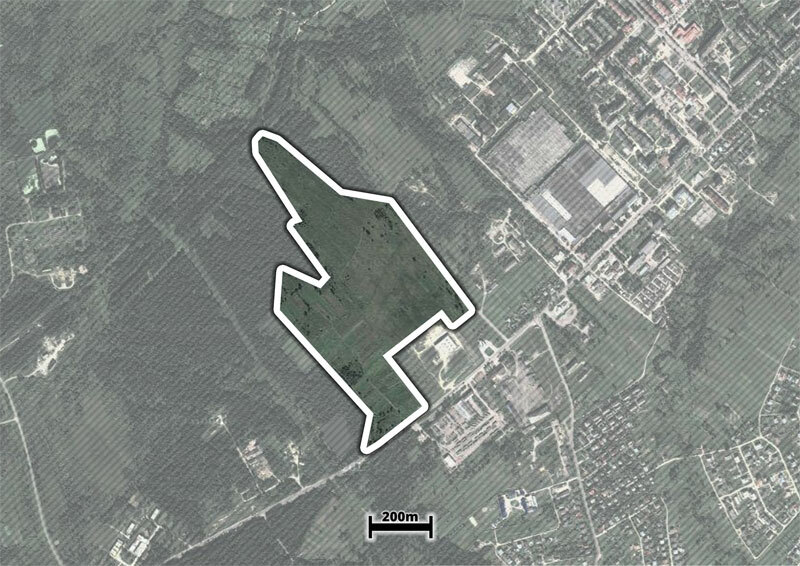 Area of investment site Total area of the investment site is 27.1385 ha. From six to eleven sites are planned on the territory of industrial park. The total area of land for leasing/sale at auction is 25.5 ha. Site I with area of 5.25 ha can meet the needs of 1-3 investors, who need small (up to 2.2 ha) sites, except where “anchor” investor appears. Site II with area of 5.25 ha, similar to site I, can meet the needs of 1-3 investors, who need small (up to 2.2 ha) sites, except where “anchor” investor appears. Sites I and II are located in such a way as to ensure equal access to the logistics infrastructure of the industrial park. Sites III and IV cover an area of 4.0 ha of future industrial park. Site V with area of 1.4 ha can meet the needs of at least 2 investors. Sites VI and VII cover an area of 4.4 ha and can meet the needs of at least 3 investors. Sites VIII covers an area of 1.2 ha and has direct access to railway track. Land specification Investment site is located in Dolyna foothills of the Carpathian mountain region. The average height above sea level is 466 m.
Type of soil: podzolic-brownsoil and brownsoil-podzolic, surface-gleyed non-affected or slightly affected by water erosion loamy soils. The soil layer is 1.5 m.
Ground water pollution: non-polluted. During past 50 years the site was not flooded. Surface water level is 4-5.6 m.
Premises (buildings) on site if any There is no premise on the site. Zoning outlined in master plan (priority usage of the territory) According to the urban master plan the territory is to be industrial land. Site I: enterprises on food and light industries. Site II: enterprises on woodworking and motor-car construction industries. Site III and IV: logistics area and development of so called joint service business centre (office equipment, trade, catering, law services, accounting services, printing and other commercial services that are not available in industrial premises). Site V provides two main business activities: Services of warehouses and storage of vegetables, fruit, berries, mushrooms, etc. in refrigerating system. Sites VI and VII: industrial areas. Site VIII: logistics hub of the industrial park – area of unloading site, engineer and transport infrastructure, warehouse premises area. Technical infrastructure Electricity: the investment site is electrified, two power transmission lines 10 kV from FFT block substation 110/10kV and transformer substation 10/0.4 kV with two transformers are constructed. Available power is 10 MW. Distance to connection point is 650 m.
Water supply: public water supply network. Distance to connection point is 500 m. The diameter is 500 mm. Natural gas: high-pressure gas pipeline. Distance to connection point is 600 m.
Sewerage: public sewage collector. Distance to connection point is 450 m.
Telecommunications infrastructure TV and radio company “Orion plus”: optical network, the most modern method of signal transmission, is laid. Modern equipment allows providing of access to broadband internet. Internet average speed is 100 MB/s. Distance to the nearest network is 1000 m.
WiFi (antenna) is installed. Access speed to the Internet connection is from 1 to 3 MB/s. Transport links to investment site The site has direct access to national motor road P-21 “Dolyna–Khust” with equipped service road. 2 km far roundabout intersection connects the motor road P-21 to a national motor road H-10 “Chernivtsi–Stryy–Mamalyha”. A railway track for industrial applications “Dolyna–Vyhoda” goes in close proximity to the site (50 m from its northern boundary). The railway track is connected to station “Dolyna” of Lviv railway. The railway tracks are laid from station “Dolyna” towards Ivano-Frankivsk, Lviv, and Chernivtsi. The station operates with passenger terminal building and freight railway station and loading point. Limits in territory development if any The priority areas of activity to determine the functionality of the industrial park are light, food, woodworking and automobile industries (branches can be added and/or adjusted properly according to the actual needs of the community). It is prohibited to locate companies that may be harmful to the environment, significantly pollute the air and/or cause any other damage to the ecology of the region (chemical, metallurgy, heavy industry, etc.) in the territory of industrial park. Environmental, health and environmental regulations under the law of Ukraine should be complied during the construction and operation of the facility. Terms of investment site transfer in operation Leasing/sale of sites. Estimated value of investment territory The investment site value is 76 UAH/m2. The site regulatory monetary value is (25.5 ha) = 825 383.3 USD. Leasing (3%) = 24 761.5 USD. This web portal is developed in a frame of ‘The school of drawing investments for public administration units of Western Ukraine’ Project. The Project is co-financed from the Polish Aid 2014/2015 Program by the Ministry of Foreign Affairs of the Republic of Poland. The information published on the web portal expresses the views of the authors only and cannot be identified with the official stance of the Ministry of Foreign Affairs of the Republic of Poland. The project is implemented by FRDL Małopolska Institute of Local Government and Administration (Cracow, Poland) in cooperation with Ukrainian partners – Institute for Policy Studies (Lviv) and Public center ‘Business initiatives’ (Ivano-Frankivsk).